So over on tumblr, there has been a project for the month of July to write daily devotionals to gods/spirits of your choice, based on this list of prompts. I’m starting this several days late, but am still determined to give it a shot, and will be posting my responses both on my tumblr and my blog. The prompt works rather perfectly timing-wise in terms of getting back into regular creative offerings right up to the point of my celebration of Wep Ronpet. I’m also hoping it will be a solid way of getting me involved in writing about any sort of spiritual matters again after being eaten by The Weddening (which was lovely, but kind of all-consuming: Italian cultural expectations for weddings – they are a Big Thing!) as well as health stuff, the new job and grad school. It feels like the right time to reconnect with my gods and my spiritual community. I tried to choose between the five deities who I honor each day in my daily rituals, spending entirely too much time this morning weighing the benefits of focusing on those Who are closest to my heart versus those Who I still wish to come to better understand and connect with. I came to the realization that perhaps a choice was not necessary: I may not write about all five of Them each day, but all five matter deeply to me, and perhaps it would serve me well to write not only about Them as individuals, but the complex ways in which They interact with me and with each other. With that in mind, a brief introduction the five gods of my spiritual family. Set: My Father, my strength, my partner in stubborn, unyielding determination and my daily visitor over early morning coffee. He is the fire behind my eyes, my unwillingness to back down from any challenge. He is what keeps me going when my own health fails, He is what inspires me to reach out to others and lend them what of my flame I can. Set shows himself to me as the Set of the North, He wears the Red Crown, makes use of the ideas and gifts of those from outside lands. He knows the benefits that come from those who are different, and He protects Them. 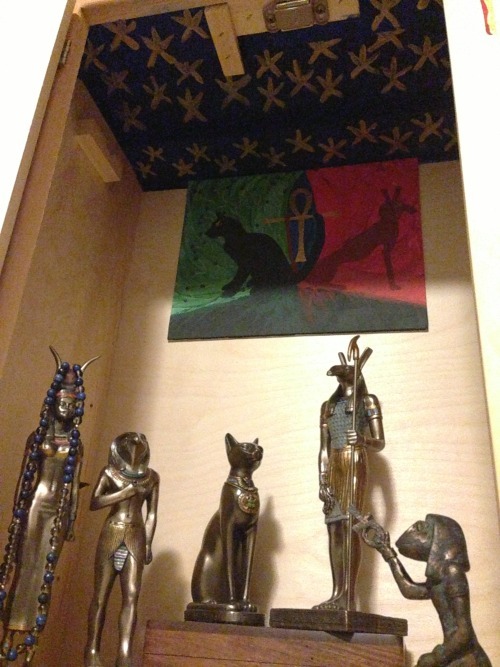 Bast: My Mother, my heart, my teacher in self-care and compassion and my nightly prayer of gratitude at the end of each day for all that is good in my life. My lady of mindfulness, She walks the world with eyes wide open to truly see and experience all that living can reveal. She is the earth in my step, the groundedness that pulls me back to reality. She is the soul to my music, the rhythm of my heart translated into song and dance and beauty. Bast shows herself to me as the Lady of Bubastis, celebrated with sistrum and dance, but also the Defender of Ra, blades in hand to cut down the snake. She is fierce and knowing, wise and full to the brim with life. Heru-Wer: My general, my instructor, my Beloved reminder of the importance of the physical body in the midst of all else. He is distant from me most days, but appears at the most critical of moments to demand greater care of my physical form when I have neglected it. He is heat that balances Set’s cold anger, when I have been attacked, the conscientious reminder to find my own role in what has gone awry. But He is also the partner and lover of my next Beloved, and it is in this role that I have started to feel safer with Him, more willing to reach out. Hethert-Nut: My joy, my laughter, my beautiful lady who dances across the night sky and asks me to join Her by abandoning my fear. She is always present, in a vast, all-encompassing way that needs no bodily form, though She can just as easily appear to me as the mind-blowingly beautiful woman with the ears of the cow, naked save for celestial skin, ready to wrap me up in the fiercest, most comforting hug one could ever imagine. Hethert-Nut often leans more towards the first portion of her syncretic nature, joining Heru-wer as consort and lover, counseling me in my own marriage. She teaches me to redefine what the concept of feminine means for me, and to embrace its power, regardless of how it does or does not align with how others may view that role. Heqat: My Grandmother, my spirit, my counselor who has asked me to become a counselor for others in turn. She is ancient in a way that extends into concepts of time that my brain cannot wholly fathom, yet so very present and adoring of each tiny, mortal life that comes into Her hands as midwife. She shows herself to me as Khnum’s partner at the potter’s wheel, imbuing life not only to those yet to be born, but to those who have lost the ability to live in their current day-to-day existence. She reaches to them, seeks to help them guide themselves a little closer to that energy of living, loving, and creating ma’at in the world. She tasks me with this in turn, such as I am. I adore Them all, and look forward to writing more about Them. Holy crap! Congratulations on your weddening! I’m very happy for you! I love the way you talk about your relationship(s) with the Divinities you walk with. I’ve always wanted to meet Heqat, but I haven’t gotten around to it just yet. Maybe one of these days it’ll happen, if She’s willing. Thank you, much! It was a truly amazing day. I hope to share a bit about how it all went in the near future, both to celebrate in spirit with my friends who I’ve come to know solely online, and also to try to hang on to as many memories as I can. As for meeting Heqat, I very much hope you find the opportunity to do so. I love Her with a fierceness that rivals the love I feel for my Parent deities. She brought gentleness and self-compassion to my life at a time when I needed it most, and has since guided me towards my new (and oh-so-fulfilling) career of becoming a clinical mental health counselor. If there is anything I can do that would help you to meet Her, both for your sake and for Hers (She practically radiates joy when someone reaches out to Her!) please do let me know!